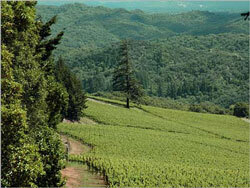 The West Fork of the Russian River defines Redwood Valley, a grapegrowing area since the 1800s. The West Fork dries up in the summer and reflects the natural condition of the Russian River before hydroelectric and water supply projects created artificial summer flows. Forsythe Creek is the largest tributary to the West Fork and supports steelhead trout and Coho salmon. Argile Chapman manages two small vineyard sites totaling 23 acres. He seeds his vineyards with an organic cover crop mix to create a thick green carpet of peas, beans, vetch, oats, barley, and clover that works to prevent soil erosion during the rainy season. Light vineyards change text Light Vineyards is an organic vineyard near the west fork of the Russian River. Thousands of oak trees were planted over the rangeland portion of the property and a major riparian restoration of the west fork of the Russian River just downstream of the East Road Bridge was completed. Light Vineyards is an organic vineyard near the west fork of the Russian River, certified in 2002. Owner Rudy Light and manager Tim Buckner have planted thousands of oak trees over the rangeland portion of the property and completed a major riparian restoration of the west fork of the Russian River just downstream of the East Road Bridge. These two small sites, totaling nearly 50 acres, are farmed organically by manager Joe Gozza and the Oster family. Owner Charlie Barr has been farming this 175-acre site for 60 years, and has implemented many innovative soil and water conservation techniques during this time. This 50-acre site, owned by Tim and Shawna Todd, is situated adjacent to Forsythe Creek and includes a well-vegetated riparian corridor. Over a third of the property remains wildland.